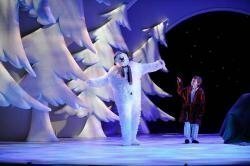 It's the festive season and once again The Snowman takes to the stage at The Peacock, its traditional home. It's time to walk in the air, meet young James. magical penguins and reindeer, Father Christmas and Jack Frost, and make friends with Raymond Briggs' charming snowman character. The show is enjoying its 19th year running in the West End, a timeless story that never fails to deliver lovely, fuzzy, warm feelings. The Independent calls it, “The best kids show for Christmas by far”. The Sunday Express says it's "Hotter and cooler than ever", and the Guardian says it's, “Guaranteed to melt the heart of even the most cynical Scrooge”. The music and lyrics come from Howard Blake, including the legendary song 'Walking in the Air' performed by a live orchestra. The design is by Ruari Murchison and the lighting – which is totally spectacular, by the way - comes from by Tim Mitchell. The choreography is by Robert North and direction by Bill Alexander. 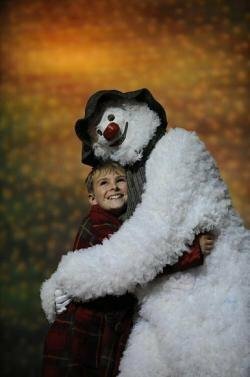 A popular family favourite, joining The Gruffalo and Peppa Pig's Surprise in theatreland for Xmas, The Snowman has transported generation after generation into the gorgeous winter wonderland occupied by a small boy and his snowy friend. These days it's a popular Christmas tradition, rich in storytelling magic. You will watch open mouthed and spellbound as The Snowman and James fly through the night sky above you. The show's fantastic blend of dance, stagecraft and live music, is perfect for all the family, from little kids upwards. Welcome to the finest Christmas family theatre treat in town! The whole experience was truly magical for outr Grandson Kai. It was magical for us as grandparents to share his awe & wonder at the magnificent show! So bright & colourful. The costumes were amazing, the animals were so lifelike, brilliant! Surprised to see penguins at the North Pole !! I took my 3 year old grandson and he loved it. He wanted to fly like the snowman! My six year old got bored half way through. We didn't realise there was no talking by the actors in the show. This performance was amazing. Suitable for anybody who has had the snowman in their life from an early age. Was lovely to see the programme brought to life on a show. 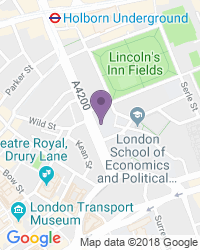 Use the search box at the top left of this page to search for The Snowman tickets availability.